189. How to Win a Big PHP ElePHPant Plush Mascott Every Month and Innovation Award Certificates? First we comment on the latest PHP versions either PHP 7.1 and 7.0 as well. Then we talk about a proposal about scalar typecasting when we are passing values to functions that may require casting like when you pass an object and it actually expects the scalar value. 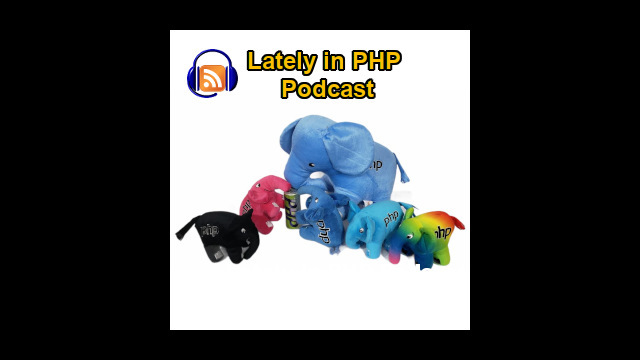 Then we talk about the preparation for the PHP 7.2 release which is supposed to happen towards the end of the year but is already scheduled here. We'll get back to this then we talk about having support for the float type on PDO database access calls. I think this is for prepared statements. And then we have here a discussion about an alternative, they say replacement but I think it is an alternative because the idea is to have two ways to serialize an object with a new interface, so I suppose the old interface will still work. Then there is a very complicated and weird proposal from a guy that elaborated an RFC and pasted it on PHP internals mailing list but after a great struggle I think we managed what he wanted to do, it's like filtering the input variables without having to use the super global variables. Then we talk about the few articles that have been published starting one that talks about an alternative class for the stdClass which is the default class for PHP objects, PHP generic objects. Then we have a tutorial article about how to install Laravel framework on Ubuntu. And finally we have an article about some weird thing that happened on Chrome that was preventing some forms with rich text editors to submit forms with articles, HTML documents to the server because there was some security block on Chrome and this article talks about what happened and now to work around the block because it was a bogus solution that probably only get fixed on chrome 58 or 59 I don't know because I did not check I just changed something on the server.